HANDS IN THE AIR: Kate McFarlane and Linda Phillips celebrate last year's Burnett Cup win. The duo are one win away from making this year's final. Sandra McLeod. GOLF: Bundaberg's Linda Phillips is modest when it comes to explaining why her combination with Kate McFarlane is so successful. 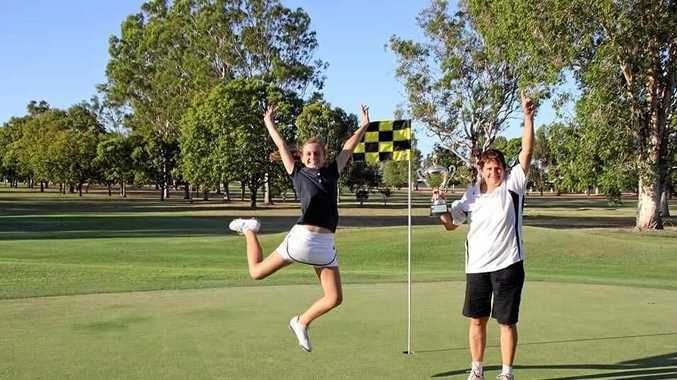 The duo are two wins away from their second straight Burnett Cup after winning the opening two rounds last weekend at the Bundaberg Golf Course. But they were made to fight for it on Sunday. Taking on talented juniors Debbie Sutton and Nikita Zwisler in the second round, the combination were put under pressure early. "After five holes I thought we were going to be flogged by those two younger girls,” Phillips revealed. The plan worked as the juniors fell away and the experienced duo won by three shots. "It was one of the toughest matches I've ever played,” Phillips said. Phillips said the back nine has been the catalyst to most of the team's success so far. She revealed the plan for them had been to always keep the matches close until they got to the back nine, so they could then get on top. "The fairways are longer and narrower on the back nine, which suit our games,” she said. Phillips said she also had a lot of trust in McFarlane to do well when they played. "She's very consistent and very reliable,” she said. The duo will play this Sunday in the semi-finals after receiving a bye in the quarters, which will be held on Saturday. In the men's competition the semis will also be held on Sunday. For full results of the Cup head to page 25.